The other morning we were awakened by the sound of a battle in the field across the road. I was first to the upstairs window, but I couldn’t immediately tell what was going on. I saw animal motion, a brief glimpse of whirling body parts — just like in the cartoons — and heard harsh squawking sounds that seemed to come not so much from a particular animal as from the battle itself. When the combatants separated, we were amazed to see them resolve into a great blue heron and a gray fox. Both animals have been around a fair amount this summer. The heron follows a regular flight pattern over our field on its way to and from the marshes around the pond. Sometimes it even lands — ka-klunk — on our roof to survey its territory. The fox considers our home its territory, too: This spring, it denned again under a ruined miner’s cabin next door. We’ve seen the kits progress from sunning themselves outside the den to batting butterflies at the edge of our yard to, recently, pouncing on insects or mice out in the same field where we saw their mother fighting the heron. The fight broke up when the heron flew to the butternut tree across the road from the house. The fox followed, jumping up and snapping at the branch where the heron perched. The scene looked like the Aesop’s fable, “The Fox and the Crow,” come to life. “I still don’t want to see it,” she said, and climbed back into bed and pulled the covers over her head. 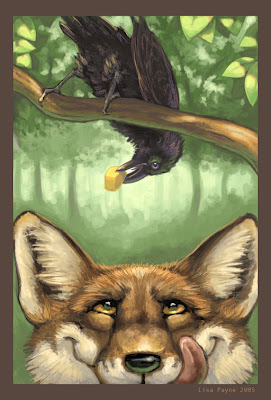 Aesop’s tale featured a sly fox and a vain crow: The fox, which fancied a piece of cheese that the crow held in its mouth, flattered the crow into singing and dropping the cheese. Writing 2,500 years ago in Greece, Aesop used animal behavior to teach moral lessons. His softened and anthropomorphized version of nature is the classical antecedent to every talking animal we’ve ever met, from Bambi to Remy. Part of my pleasure the other morning was in seeing both the fable and beyond it, to actual animal behavior, even if the fox was trying to eat the heron. Ursula likes Aesop’s fables, but she’s not quite ready to see the often violent reality they’re based on. That's OK. It's fine with me if her foxes stay smooth talkers a little longer.